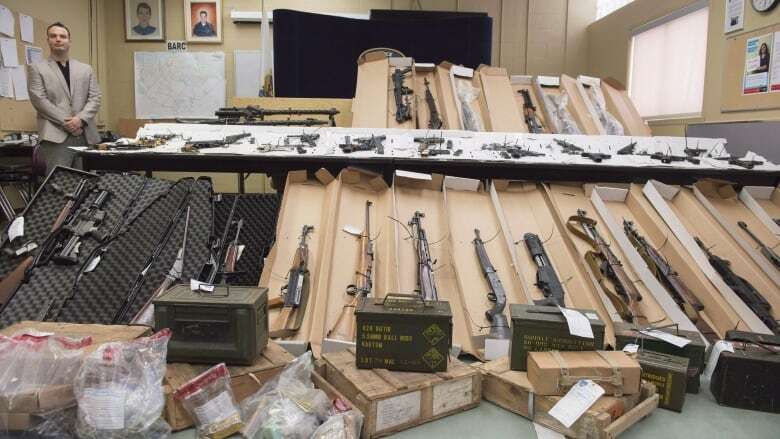 The emergence of the dark net — the hidden depths of the internet accessible only through tailored software — is posing new challenges for authorities trying to tackle gun trafficking, said Rob O'Reilly, interim director of firearms regulatory services at the RCMP. While police have shut down rogue online markets like Silk Road in recent years, others quickly pop up in the deepest realms of cyberspace, O'Reilly recently told a national symposium on gangs and guns. O'Reilly displayed a photo of an AR-15 magazine and ammunition shipped from a vendor in Montana to a Sudbury, Ont., buyer who had no firearms licence. "Darknet vendors resort to very ingenious means to ship firearms and related components," O'Reilly said. "In the darknet community, this is known as stealth shipping, and the intent is to disguise or hide the actual contents from law enforcement and border services." Pistols have been sent in gaming consoles, computer hard drives, hairdryers and blocks of chocolate, he said. "We've even seen rifles shipped behind flat-screen televisions." The Onion Router network, known as Tor, is often used by government agencies, activists, journalists and whistleblowers who may want to shield their online activities, O'Reilly noted. However, it can also be employed by people with less noble intentions, such as illicit firearms buyers. "Such currencies present a real challenge for law enforcement because it doesn't physically reside somewhere, making it hard to trace without special, very expensive software and highly trained personnel to do the work," O'Reilly said. "This challenge has existed for some time in regards to our neighbours to the south, however it is compounded in a borderless online market that is truly international," O'Reilly said. "Once imported to Canada, these components can be easily finished and assembled through online tutorials, the results of which are often completely untraceable firearms, sometimes known as ghost guns." Police training needs must be "continually updated" to reflect the rapidly evolving online environment, O'Reilly said. "Conducting online investigations, whether on the darknet or on the surface web, requires a very specific skill set." Could a firearm registry halt Ottawa's rising gun violence?